Two state election are due in March 15, 2014 in Tasmania and SA. The most recent EMRS opinion poll in Tasmania showed the ALP with just 22 per cent backing, compared to the Greens' 19 per cent, and the Liberals' 49 per cent. 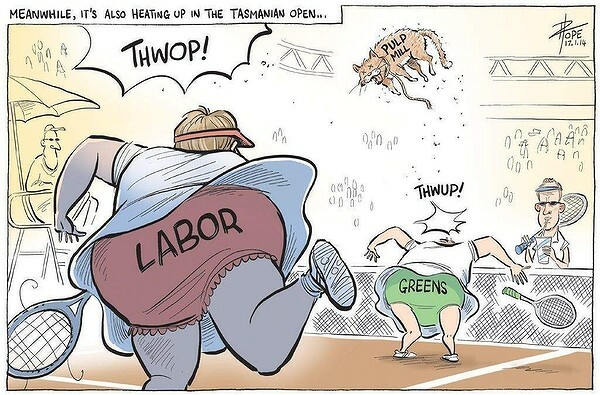 Tasmania Labor has decided to go it alone -- it has dumped the coalition with the Greens (Giddings sacked the Greens from cabinet). It is going to fight for the old toxic Gunns' pulp and paper mill. Tasmania Labor is desperate, and it appears to have little interest or commitment to driving the transition to a new economy. Their mantra, like that of the Liberals, will be jobs in the mining and forestry industries. SA, which has one of the 3 Labor state governments still in power, has seen the electoral tide seemingly running against a Labor Government in SA, which has been in power for 14 years---a Newspoll just before Christmas had Labor at 33 per cent and the Liberal Party at 40 per cent). The Labor Party's strategy is sandbagging. To govern in its own right, the Liberal Party needs to pick up six seats, after a 7.7 per cent swing delivered them four seats in 2010. The conservatives won the majority of the popular vote last time and still wasn’t enough to return them to government. The ALP successfully sandbagged its marginal seats in 2010. It must do it again, as it is not likely that it will gain many seats from the Liberal Party. The ALP is not popular due to its recent planning changes aimed at increasing urban density in the city and inner rim. These have ignited a storm of controversy, with residents groups mobilizing in opposition, suburban-rim mayors holding crisis meetings, and the Local Government Association recently saying they’d lost faith in the planning process. This is largely a resistance to a revitalized Adelaide becoming a small city good at innovation, new technology and commercial development and research outcomes. The revitalization is slow but the introduction of new laws finally make it easier for people to start small bars in the CBD whilst the modernization of Adelaide is clearly visible in the CBD's west. A big shadow of over the state is the closure of General Motors Holden and it is unclear how this will play out in party political terms. with respect to how the will state recover, from this ongoing process of de-industrialization. The 2900 jobs lost from Holden is the tip of the jobs iceberg. Surrounding the automaker is a complex web of suppliers, more than 700 in South Australia. Around 30 of these are major suppliers and many are highly dependent on Holden. In other words, they are very likely to fall over.Nationwide, Holden’s presence in Australia stimulates around $4 billion per year of economic activity and more than 60,000 jobs. In South Australia, that translates into around $1.2 billion per year and 13,000 jobs. Alternative manufacturing jobs are not likely to be an option for those who are retrenched – we have lost nearly 30,000 of them since the Global Financial Crisis in South Australia and many more are likely to go so long as trading conditions remain as hostile to manufacturing as they currently are. Publicly funded Investment in infrastructure appears to be the general policy response on the grounds that if you don't invest you stagnate. Economic stagnation would be the result with business-as-usual. I cannot see Gidding's Labor in Tasmania embracing a new economy in the form of ICT and the digital economy, the creative economy, tourism, agriculture based on our priceless clean green brand, fine food, quality wines and beverage at the macro and micro level, science, aged care and international education. They remain focused on the past--just like the Liberals. The neo-liberal Right, meanwhile, want Tasmania to stop being a leech on the mainland, to base GST payments to the states on their population, and to reduce the State’s minimum wage. Taking this kind of axe to federal support for Tasmania means that Tasmania’s GST transfers from the federal government would be cut by $650 million per year. That amount is the equivalent of half of the state's entire Education expenditure or more than its Housing, Agriculture and Transport expenditure combined. Comments are all closed due to a very heavy spam attack that has been going on for 36 hours and shows no sign of easing up. The ALP in Tasmania has promised an economic revival on the back of failing industries such as forestry and it has provocatively pre-selected anti-Green, pro forestry conservative candidates Bob Gordon and Julian Amos. Giddings will recall parliament on January 28 in order to pass legislation – with opposition Liberal support – to secure the legality of the process to approve a large-scale pulp mill in the northern Tamar Valley. This move is designed to show political support for a contentious project that has little likelihood of getting off the ground. It is designed to appeal to the old right wing base of the ALP, the trade unions, and traditional Labor voters.